The egg is a pretty amazing way to produce offspring. Unfortunately, some eggs never hatch, some just get cracked and some even get rotten. As a food source they are full of good stuff, long-lasting and able to be served up in countless ways. Interesting, we’ve heard judges at retriever tests referred to in “egg” terms, such as “they sure hatched a good one there!” Or, more commonly, “the judges laid an egg!” meaning they laid a rotten egg! Dennis: Ask around, “What is a good test?” and you will get many different answers. I think there are some obvious ones but among the most important characteristics of a good test is that it is fair and the same for all dogs and that it is matched to the level of the stake and the quality of the field. I have a simple measure of how well a test meets those criteria. I simply look for variation in performance that stays the same throughout the test. For example, if all the dogs do very well, the test is too simple. If most of the dogs do very poorly, the test is too difficult. If I see some dogs do very well, some very poorly and some just average, I conclude the test is at the right level. If the test starts off difficult and becomes easy (or vice-versa), conditions have changed making it unfair. These two criteria, consistency of your test and variation in performance, are characteristic of a good test in my book. Without them, you just might have laid an egg. Ted: I guess I have never thought about variation in performance as a guideline, but now that you mention it, your standard makes a lot of sense. But, it only describes what we are trying to prevent, it doesn’t really tell us how to prevent it. Dennis: I agree. It is simply a measure of your test. It is also something that you can do after the test to evaluate how well you did. One of the tools that I use is a running tally sheet in the back of my judges book. It has the dog’s number and boxes for each series. As the dog runs I check off “ back,” “ out,” and ? (need to talk or see more dogs). I also make notations for pick-ups, handles and start time of test. At a glance, I can see how well things are going and at the end of the test assess where we’re at including the variation. After a trial at home it’s easy to do a simple analysis of how variable work was, distributed throughout the day. You can even see if callbacks are clumped. Pretty easy to give yourself an honest bummer or 5-star rating. What do you think we need to do to prevent laying a rotten egg? I so rarely see tests with all of the fundamentals that when I do see one, I am basically satisfied. If the test is fundamentally sound and challenging, I am in hog heaven. If the test is fundamentally sound and too easy, most of the time, I attribute that to judges that lack dog knowledge. On rare occasions, judges that I know and respect, come up with tests that are too easy. But, I don’t consider tests that are fundamentally sound, which turn out to be too easy, to constitute “laying an egg,” unless the judges pencil whip the field to account for the ease of their test. Dennis: I like your fundamentals to help with setup and evaluation of the test. But I do consider judges that have to “pencil whip” the field because of too easy a test as having laid an egg. A lot of tests that I have seen were considered “too hard” by contestants because of a lack of one of your fundamentals. Fundamentals or not, if I see I see a 60 dog entry, including some of the top dogs in the country, and I see that 75% of them can’t get the opening series of marks without handling – that’s a problem. I’ve seen one trial where only 10 out of 80 dogs got the birds without a handle or a horrendous hunt. I think these things are a problem that happens more often than it should. On some occasions it is due to a really deceptive situation, such as a retired gun tight in front of an out-of-order flyer. This can fool most dogs into running long and not stopping the next time either. I think it’s quite easy to set up a test that it too hard. I like to think I could out smart any dog by challenging them with something extreme but I sure don’t think that is my job as a judge. I hate to think that a judge is so egocentric that he willingly strives to make dogs look bad. Personally, I like a test that is challenging and difficult but if it makes too many high-end dogs look bad, I think there is a problem. I saw a test once that made 5 National Champions look like idiots. I had to conclude that the problem was the test not the dogs. It’s hard to tell by looking at the test whether it was set up too extreme because the judges ramped it up to make sure it wasn’t too easy and they might get burned or whether they want to appear commanding or unique or they had a malicious agenda. In other words, did they lay their egg intentionally? I personally don’t think a lot of poor tests are intentional but I do believe many could have been avoided with more thought and care. I think working to ensure fairness to the dogs and equality throughout the day goes a long way to having a successful trial. Ted: In our last article, I wrote about preparation as the key to success in judging. Like you, I am very obsessive about my judging assignments. I believe that my work as a judge reflects directly on me. Consequently, I want the product I present to the handlers to be the best that I can possibly produce. And that requires a lot of hard work and preparation. Here is a list of things that I try to do to help make test fair for all dogs plus give them a real chance at showing their strengths. Set marks downwind to guard against a moderate wind shift. Crosswind blinds are safer. Set your marks so that you can see the dogs as they hunt in the area of the fall (AOF) and as they pick up the bird. Call for the birds slowly enough to allow ample opportunity for the dogs to view each bird. Retire guns as close to the gun station as possible to eliminate the impact of bird boy trails and out of AOF throwers. Make the corridor of your blind wide enough to allow a handler two whistles during critical portions of the blind. If the dog must be out of sight during a blind, make sure that it is not more than a few seconds and that you allow the handlers an opportunity to correct the line if the dog pops up off line. In addition, there is much we can do with bird placement and incorporation of factors to help design good tests that are easy to evaluate. But the fair and robust test that holds up all day helps keep both judges and contestants happy. 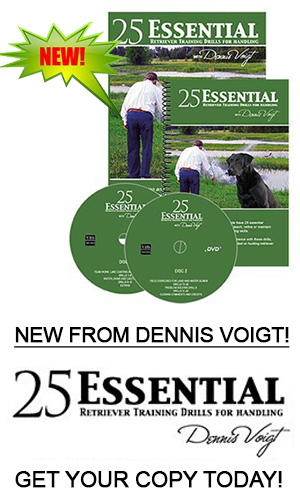 Dennis: We’d be remiss if we didn’t emphasize the importance of time management in preventing the rotten egg test. When judges run out of time, test quality suffers, callbacks get severe and poor decisions are made. Time management involves setting up a test that takes the correct amount of time given the logistics of line and test location and it considers the club’s mechanics. You need to factor in bird changes, no-birds, lunches, waiting for dogs and pick-up delays. There is a lot you can do to save time. Do everything in your power to start on time. Sometimes, club mechanics get you but make sure it isn’t your fault that the test isn’t ready. You can save a lot of time by having quick callbacks. If you have to debate for long about a dog better to just bring it back. Get the “guns up” as the dog is returning, have the running dog deliver on the honour line, call dogs to line promptly and time your bird/gunner changes with lunches, etc. A minute or more saved per dog is easy to achieve, which for a 60 dog entry is a full hour – time you may need Sunday night. Ted: Actually, I think that rather than be the last issue for discussion, this should be the first issue of discussion. I think everything starts with time management. I don’t think enough judges really give sufficient consideration to time. When the judges don’t pay attention to time, the odds of laying an egg increase significantly. Dogs are run in poor conditions. Tests are split. Callbacks are brutal. When I judge, time management is a primary driver for my decision-making. Time tells me what I can and cannot do. I may come to a field and see a test that I would love to run, but if it doesn’t fit my allotted time, it must be discarded. For example, I will be judging in Florida this spring. I look at my Sunrise/Sunset table for April 1, 2011, and see that Sunrise is at 7:23 am and Sunset is at 7:52 pm. If we start running dogs at 8 am, and finish our day at 6 pm, I have 10 hours of light with which to work. (If we go until 7 pm, I have another hour.) I am judging the Amateur. For purposes of discussion, assume that the Amateur starts on Saturday and ends on Sunday, further assume that there are 60 dogs entered. If I simply want to do marks on Saturday, I have 600 minutes with which to work. If I have a ten minute test, I will not finish on Saturday when you consider no-birds, re-birds, gun changes, lunches, waiting for handlers, etc. So a ten minute test is guaranteed to run two days, and will make Sunday a mess. So by not paying sufficient attention to time, I have laid an egg. In contrast, if I have a quick seven minute test, the test will take seven hours, I can add an hour for re-birds, lunches, etc., and because I am pretty efficient with callbacks, I probably have two hours to run a land blind. Depending on the number of dogs called back, I might be able to get through a land blind, but it would be tight. If I don’t finish the land blind on Saturday, or dogs are running in the dark, and neither dogs nor handlers can see one another, I have laid an egg. If I have a six minute test, I am pretty certain that I can get two series under my belt on Saturday. Which leaves me with only a water blind and water marks for Sunday. If I am certain that my test will whittle the field significantly, I might not care if I didn’t get to a land blind on Saturday, but if I guessed wrong, and the dogs ate my test alive, I would really be in a bind. The point is this – time management is critical. Dennis: I can’t argue with you regarding the importance of time management – I guess that’s why we wisely left it for last. However, on reflection about how I go about judging assignments, I realize that I don’t start with time management as the first consideration. Rather, I simply consider it in every decision I make with my co-judge about the setups. That means that I seek the fair and fundamental test, as we discussed earlier, but I am doing that with many other considerations in mind. Some of these are mechanical which is surely related to time. I other cases, I am focusing on things such as day-length, fairness of rotation, other stakes, club mechanics and grounds and the forecast weather. I try to make every bird count and don’t have an extra just for a delay. I guess I don’t even think of these things as being “time elements” any more. To me they are just ways I view good test design but I do try to consider all the conditions that will prevent a screw up and will produce a good fair trial. But I guess you are right that all other considerations on setup day must be in the context of good time management. Regardless, once you have your test set, then my priority becomes “DO NOT WASTE TIME” on test day. Ted: I have a similar list. In my case, it’s spelled out as things that “I Believe In” rather than a checklist of considerations. Some of these I have already mentioned above but I include them here to have the whole list together. Set up tests that you would enjoy running and watching. When in doubt, err in favour of the dog. Always walk your field to identify any safety hazards for the dogs. Set marks downwind, blinds crosswind. Don’t run into the sun. Make the birds visible (consider your background, lighting, etc. and use tape if necessary to help the dogs see the birds). Where wingers are used, make certain that the bird throwers include a throwing motion as they kick the winger. Shoot the money bird (the bird you think is most difficult) first so that dog has an optimal opportunity to see it. Don’t use four birds where three will do. In my mind, such complications are invitations to either no-birds, which are costly in terms of time, money, and call backs - and which, introduce too much variance to a process that we should make as uniform as possible. Don’t place the honour in a location where the running dog must either (a) pass closely by the honour dog on its way to the line; or (b) run closely past the honour dog on its way to the last bird down. Failure to do so is an invitation to dog fights and breaking, neither of which I wish to encourage. Construct your blinds so that good handlers with fast dogs have at least two whistles to navigate critical points in your blind (e.g. on and off a point, through a keyhole, in and out of cover). 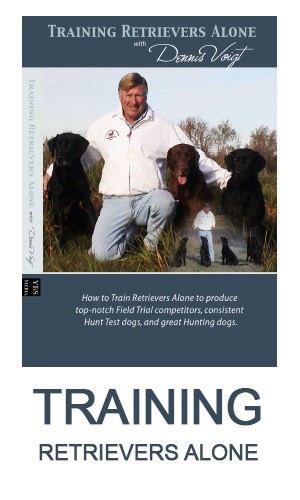 As dogs and handlers improve, it has become increasingly difficult to construct a land blind that dogs will fail outright without the use of use devices as keyholes, poison birds, and the like. By and large, these devices favour the slower, more methodical dog who can be handled away from the hazard. Because I like fast, stylish dogs, I try to construct my blinds so that the good handler has at least two whistle opportunities to cast away from the hazard. Dennis: I suggest that between our two lists a lot of things are considered that would help us have a good trial. Combine them with good time management and our odds go up even higher. I guess the only thing left is how well we place our birds and incorporate factors. That’s a huge topic, of course, perhaps best left to a future issue. ___ What type of dog will win this trial?